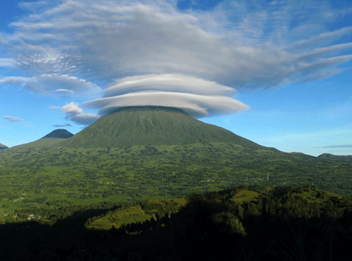 in Kinyarwanda which means “white shell”, referring to the white-capped summit which is often seen on top of this volcano. It is flanked by Mikeno to the north, Bisoke to the east and Nyiragongo to the west, on the other side of the Rift Valley. The mountain is situated in Volcanoes national park, popularly known for the mountain gorillas. Climbing Mt Karisimbi is a strenuous yet very rewarding hike which is normally done as a complement to gorilla trekking and all done within Volcanoes National Park. The climb starts early in the morning taking 6 hours and involves navigating through the Bisoke side before reaching the first stopping place at an altitude of 3,700 metres for overnight camping before finishing off the journey the next day. The hike up the summit is characterized of muddy trails especially during rainy season, though due to the altitude, it can rain at any time of the day. You need relatively good health and stamina to hike through the slippery slopes to reach the summit which is white capped as a result of hail and sleet which accumulate in the higher elevations from its frequent storms. This implies that one may have to incur an extra cost of hiring a porter ($20 per day) to help in carrying your luggage and hiking equipment. Karisimbi is also close to the Karisoke research center where the grave of the re-known mountain gorilla conservationist and American zoologist; Dian Fossey lies. This means that one has a chance to visit the grave as well as trek the golden monkeys in addition to the Mountain gorillas.